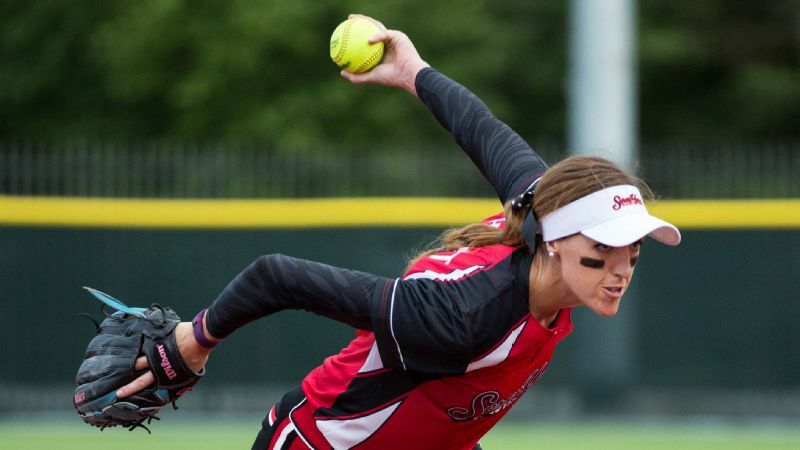 TUSCALOOSA, Ala. -- Speaking about a former teammate who had just ended her season Sunday, Monica Abbott described Chicago Bandits veteran Danielle Zymkowitz as a "rallier." As in, one who rallies those around her. The qualities Abbott was talking about make the longest-serving player on the Chicago roster -- now in her sixth season in a league when making it half that long makes a player grizzled -- an important part of the culture of a franchise that annually punches above its supposed weight. Whether by bloop single or lined double, Danielle Zymkowitz refused to let the Bandits' season end Monday night. She has been there before. The Bandits have been there before. And it is a franchise that is at it again after its 11-5 win against the top-seeded USSSA Pride leveled the best-of-three National Pro Fastpitch championship series and set up a winner-take-all finale in a softball rivalry every bit as special as that between the United States and Japan or Arizona and UCLA. What Zymkowitz began with a bloop single over the head of the shortstop in the bottom of the fourth inning, veteran teammate Brittany Cervantes completed with a much longer but no less arcing home run off the light pole in left field in the sixth inning. 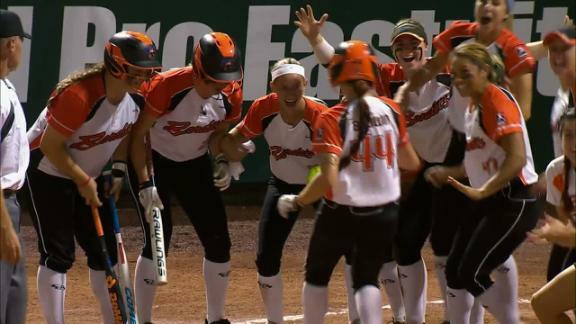 From the brink of elimination, the Bandits won by scoring more runs than any team scored against the Pride this season. The Bandits finished the regular season with a losing record, a rarity for them. They weren't supposed to win a semifinal series against the ScrapYard Dawgs, the team that signed away Abbott this spring. But here the Bandits are on level footing with the Pride with one game left in the season, the same two teams left to settle a championship for the sixth time in the past seven years. "You asked who would we rather face," the Pride's Megan Wiggins said. "In all honesty I would have rather faced ScrapYard because I know the type of team [the Bandits] are. It doesn't matter the opponent that they're playing, it doesn't matter the pitcher that they're facing." She should know. She was the thorn in the Pride's side when she played for the Bandits. For the fourth time in as many postseason games, the Bandits scored first. With one out in the bottom of the third inning, Taylor Edwards drilled a pitch deep into the Tuscaloosa night for a home run. If the lead was familiar territory to the Bandits, it was unfamiliar to the Pride, their first deficit of the playoffs. It didn't seem to bother the best lineup in the league. The Pride rallied for two runs in the top of the fourth to take the lead. But instead of the beginning of the end for the team that presumably needed every break to fall its way, the Bandits made it the beginning of the fun. They answered the Pride's runs with five of their own in the bottom of the fourth inning, Zymkowitz's bloop preceding, in due time, Jill Barrett's three-run home run that pushed the lead to 6-2. The Pride answered again in the top of the fifth inning to cut the lead to 6-5. And again the Bandits answered in kind. Zymkowitz lined a double in the bottom of the inning that was the first step toward two more runs and an 8-5 lead. This time the see-saw never budged. The Pride went quietly in the top of the sixth inning, and Cervantes' three-run home run in the bottom of that inning provided the exclamation mark. The Pride lineup Monday night included hitters ranked first, sixth, eighth and 15th in NCAA career home runs. 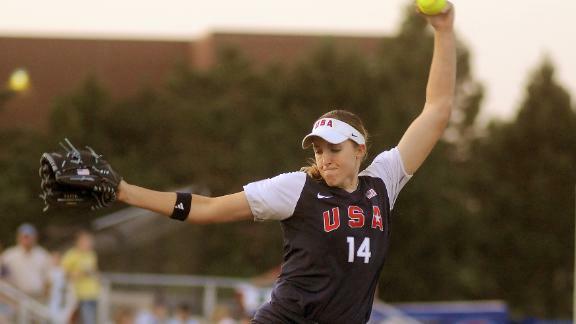 That list didn't even include former Olympian Kelly Kretschman, the NPF MVP this season. Or Wiggins, a former MVP and an all-league selection the past six seasons who made the rich richer when she moved. In Zymkowitz and Cervantes, the Bandits' lineup had at its heart two veterans who went undrafted and made the team by way of open tryouts in 2011 and 2012, respectively. Coach Michael Steuerwald said 45 players might show up for those annual tryouts, more than half of them former Division I players. Out of that mass, the team might find one or two who could help. No team more consistently finds talent that others overlooked, Zymkowitz and Cervantes the descendants of former finds like Amber Patton and Tammy Williams. 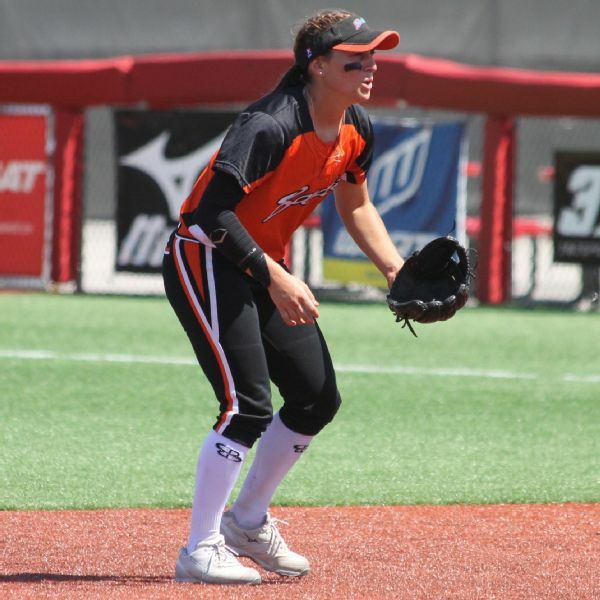 And the former pair may, in turn, hand over that mantle to the likes of Megan Blank, the former Iowa standout who signed with the Bandits out of a tryout a year ago and had two hits and an RBI in Monday's game. "I think everyone knows the level of talent across the country is incredible," Steuerwald said. 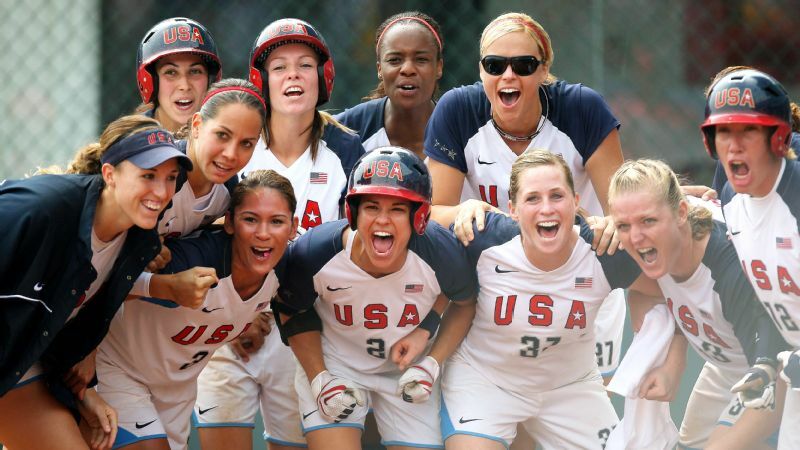 "There's girls that aren't playing in this league that could be and should be. And hopefully they have more opportunities as years come along. But for us, it's a huge thing. We look at players that might not be drafted. For Cerv, [Kentucky] sent up film of her and we said 'Hey, can we get her to tryouts.' "
The story isn't always exactly the same -- rookie pitcher Shelby Turnier, so poised in relief in both this game and the elimination game a day earlier against ScrapYard, was a prized second-round pick, as was starting pitcher Michelle Gascoigne in 2014. Barrett was a fourth-round find, but it was Akron that found her. 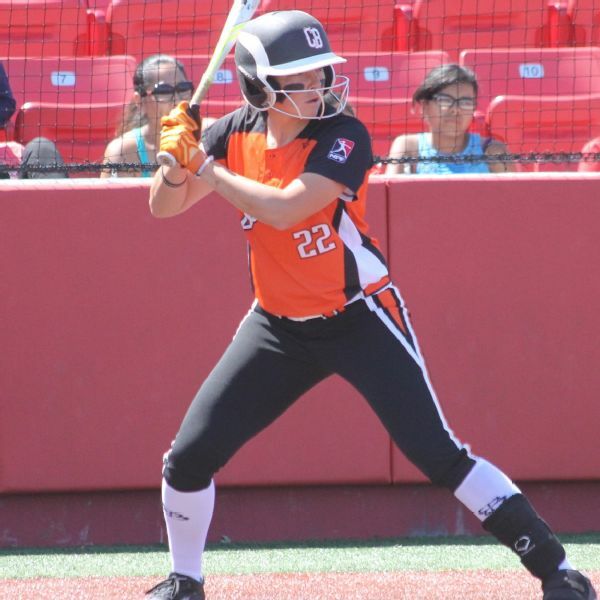 The Bandits paid a first-round price to acquire her last fall. But the essence of the Bandits is in stories like those of Cervantes and Zymkowitz. Always in the shadow of the Pride, the Bandits perpetually play with something to prove. The entire first round that was selected in the 2012 draft is now out of the league. Cervantes has another game to play Tuesday. Cervantes played sparingly as a rookie in 2012. 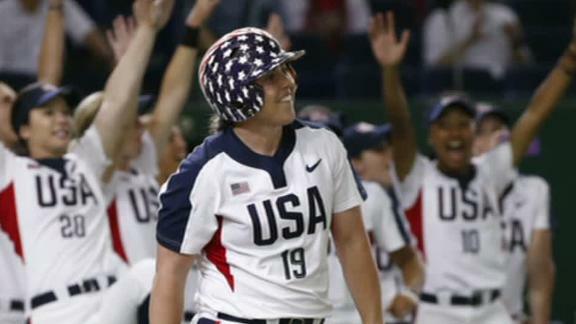 She recorded just 50 at-bats and eight hits for the summer. But the talent that made her one of the best run producers in the SEC matured in the professional game. She was the NPF offensive player of the year a season ago and ranks fourth in the league in on-base percentage this season. She is one of the best hitters in the world and has looked the part here with eight hits in five postseason games. Brittany Cervantes' three-run homer in the sixth ensured Chicago would live to fight another night. "After our final game [at Kentucky], I knew I wasn't done yet," Cervantes said. "Even though I knew I wasn't playing [as an NPF rookie], I knew I was getting better, just by watching the people above me, like Vicky Galindo, Tammy, Amber, Shannon [Doepking] and Monica. Everybody was still helping me become a better player. It's fun to see the hard work kind of pay off." She and the Bandits manage a difficult balancing act, playing with a chip on their shoulders without seeming churlish. She used the word fun, and that genuinely seems to describe them. Steuerwald said this particular group was the most fun he has been around in Chicago -- even when it wasn't winning or playing particularly well early this year. But there is also an edge to them. Cervantes said the bat flip that followed a Wiggins home run in the opening game of the title series wasn't a source of motivation, but she made clear that there was some extra motivation stoking a rivalry that already burned hot. So often, too often and too easily, the lament is offered about women's sports that there aren't enough upsets, there isn't enough parity. It is too often Serena Williams or the Connecticut women's basketball team marching to titles. The naysayers should take the time to watch the finale in Tuscaloosa on Tuesday night. There will be a great team that should win. There will be another team that believes it will win. And which team does is anyone's guess. Like any real rivalry. "Some of our vets have played in three, four championship series now, so they're not scared of the situation," Steuerwald said. "But at the same time, I think if you asked everyone in the softball world should we be going to Game 3 against the Pride tomorrow night, you probably would have won a lot of money in Vegas."